The middle of last year, I got a couple of high scores at the local arcade. I mused that the scores had been reset recently as they weren’t very high. 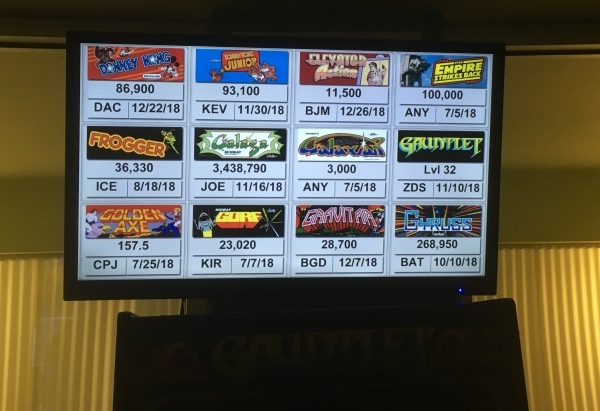 When we went back last week when our kids were on Christmas break, I discovered how it works: 1984 resets its annual high scores on July 5, the anniversary of the arcade’s opening. So I’d hoped for another easy score of a free button and free pass for my next visit to the arcade (between high score free passes that my beautiful wife and I both earned, we had a two-for-one coupon, so the whole family got in for only $7.50), but with six months of previous players, and quite honestly, better players to contend with, I decided to go with the A-10 Warthog strategy: Low and slow. Instead of working on video games that I enjoy or games that I can play passably well (which is, come to think of it, none of them), I looked for old, slow games that won’t captivate the players from today who’ve grown up on PlayStations and Fortnite. So I watched the board scroll by, and I saw that Elevator Action had a high score of 10400. So I went to work on the game. I played a couple of times straight up, trying to get the secret documents and whatnot, but I wasn’t improving fast enough to make the high score. Each set of documents was worth 500 points, and killing an enemy spy was worth 100 points, so I decided to camp in a defensible position and try to shoot or jump side kick 105 bad guys. Which I eventually did after hogging the game for about an hour. Did I say “hogging”? Clearly, I exaggerate, as nobody else seemed to want to play the slow, 35 year old game. It was pretty busy at 1984 that night, but everyone crowded around the later games or the more popular games, leaving me to shoot and dodge bullets until I had the high score. I guess in a loud arcade, en sounds like em. But I got a button and a free pass. I could have gotten a little higher in score, as I didn’t realize I got an extra life at 10,000 points and stepped back for my final brief life. Pick an old game, probably a slow game that bores modern players. Which will most likely have a low high score. Play the game to score points, not to advance the plot. We will see if this strategy holds true the next time I go to 1984, which might be in the middle of July again. But I know what game I’ll spend my time on: Space Invaders. It looks like one only needs to get through the first two levels to beat the high score, and I’m pretty sure in a couple of hours I could do that. You know, my kids watch YouTube videos about video games all the time. I can only hope that the videos they watch are more interesting than this video. BECAUSE THAT MEANS THE KIDS WILL BE TOO BORED TO PLAY THE OLD GAMES UPON WHICH I NEED TO SET HIGH SCORES.